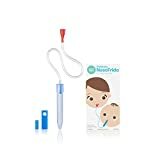 PEDIATRICIAN ENDORSED BABY NASAL ASPIRATOR - Doctor invented nasal aspirator that uses parents' own suction to safely and effectively clear stuffy noses. HYGIENIC - Disposable filters are clinically proven to prevent the transfer of mucus or bacterial germs to the snot sucker when clearing stuffy noses. COMFORTABLE & NON-INVASIVE - NoseFrida creates a seal with the outside of the baby's nostril for seamless gentle snotsucking. DISHWASHER SAFE - The nasal tip, red mouthpiece, and filter cap are top-rack dishwasher safe allowing for the baby aspirator to be easily sterilized. MADE IN SWEDEN and is BPA & Phthalate free.